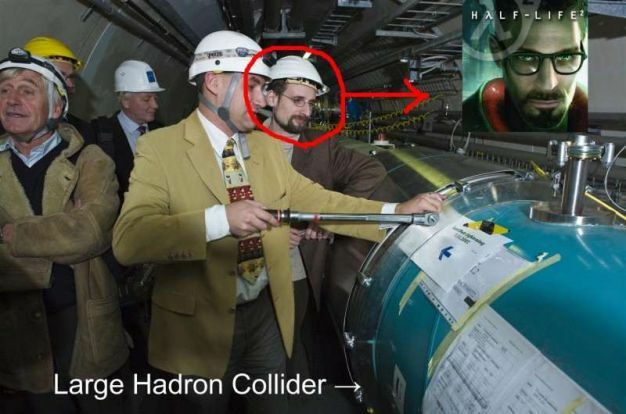 Have you heard of the Large Hadron Collider? It’s going to the end the world and they’re turning it on tomorrow. The massive particle accelerator is located in a giant underground base in Europe, is sixteen miles long and may possibly be capable of creating tiny blackholes that will destroy all of mankind. Or that is what the press is saying. The scientists from over 85 different countries who worked on it say it’s completely safe and that all it’s going to do is redefine physics as we know it and allow us to see exactly what keeps us all together and creates mass. So tomorrow is going to be a big day either way it goes. However, Joystiq has discovered the final nail in the coffin of the idea that this machine is totally safe. Gordon Freeman has been spotted nearby. Now I’m not one to hold something over another person but it seems that no matter where Mr. Freeman goes trouble happens to follow. I’m all for the advancement of science, but if we want humanity to survive either get that man away from that machine or give him a crowbar, as these are the only choices. If you’re interested in hearing the first people in the world to be attacked by headcrabs, you can listen to the live broadcast of the LHC being turned on here.